I can't remember what or where I was reading it but I'm pretty sure they were the words of an audio reviewer. He was questioning how often reviewers still use the accessories/tweaks a year later that they claimed so indispensable in a review a year earlier. I remember thinking that he should just speak for himself before he insinuated anything about reviewers at large. Maybe he was. Anyway, I had just looked at my system and figured that it was time to do a little housekeeping. Now, I don't have nearly enough room behind my system to make sure that no two sets of cables run parallel but always cross at perpendicular angles. But what I can accomplish is that where masses of cables cross paths, I can shield cables by running some of them through Z-Sleeves. If you've got three sets of cables sharing proximity, running two pairs through the Z-Sleeves shields all three pairs from each other. Get it? So, that's what I did. I also introduced from the sidelines some Z-Sleeves that had not been in use. Following was a thorny week at work and I didn't even turn the system on for the next five or six days. By the time I got back to the music, I'd frankly lost cognizance of what I'd done and listening for differences that may have resulted was the farthest thing from my mind. But upon powering up the Canary CA 160 amplifiers, I instantly knew that something had happened to my system. It was immediate and I heard it even before the amplifiers had time to fully warm up. My first thought was that the Gallo Reference 3.1s had hit a new plateau in their break-in. But frankly, the magnitude of the difference was greater than I would expect had it been the speakers at that time. What I heard was more on the magnitude of what I'd expect had I replaced all the tubes in the amplifiers with something really special. Or maybe upgraded the phono cartridge to something I can't afford right now. It was certainly greater than what I'd expect were I to upgrade my DAC. In other words, we're talking a substantial step forward. Maybe even a leap. What was I hearing? Well, there was at least one more veil removed from the system - a fairly nasty and opaque one. The noise floor had definitely dropped and low-level detail was more readily apparent. Bass didn't deepen or become more powerful but it was cleaner and more highly defined. Everything sounded decidedly less cluttered. There was more delineation between the notes and micro-dynamics were more highly pronounced, something I attributed to less haze and noise between them. When I realized what had really happened to my system, I was very pleased at what I had attained. I also remembered the words of the aforementioned reviewer. I decided that a Z-Sleeve follow-up was in order. But before I took to writing, I popped over to Z-Cable's website for a look-see at what they'd been up to since. It was then that I realized that my original Z-Sleeve review was going on not one year old but two. 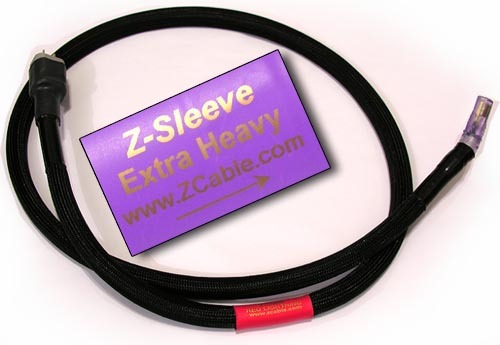 Not only did Z-Cable have a new website but they'd got a slew of interesting products... and a new Z-Sleeve. I decided to drop ZCable's Mark Hampton a line. He responded, "... I've made some changes in the last year or so. I have upgraded the LIGHTNING power cord designs, as well as within the last week have developed a new EXTRA HEAVY Z-Sleeve that is about 2 to 3 times as powerful as the previous HEAVY Z-Sleeve. Yes, 2 to 3 times! It's really cool." Heavy Sleeve? Extra Heavy sleeve? The Extra Heavy was claimed to be more effective than the Ultra Sleeves that I'd been using since their review. It certainly looks the part. At 8 inches long, all the Z-Sleeves share the same length. But the heavy is of substantially greater weight. ZCable told me, "The EXTRA HEAVY Z-Sleeve, not only has stronger shields than the HEAVY had but improvements were made in its support of the concentric magnetic fields. This gives the EXTRA HEAVY a more powerful zero gauss Z-Sleeve Effect, and also more detail than the HEAVY." Of what would the Extra Heavy be capable? Given what I'd just accomplished with my system, I was more than curious. Hampton seemed pleased to send me a batch of these new sleeves and I was happy to give them a try. Looked like a simple follow-up was ab out to turn into a review of new products. Hampton also sent along samples of his new RED and BLACK LIGHTNING power cords, which he claimed were also more effective than previously produced models. "Z-Sleeves are not ferrite or resonance-control based. Rather, they are designed to approximate a Zero Gauss Chamber. The tube creates an internal magnetic null area that completely obliterates EMI contamination. This is accomplished through the specific combination of shielding materials, dimensional rations and increased abilities of those shields to hold and store EMI. 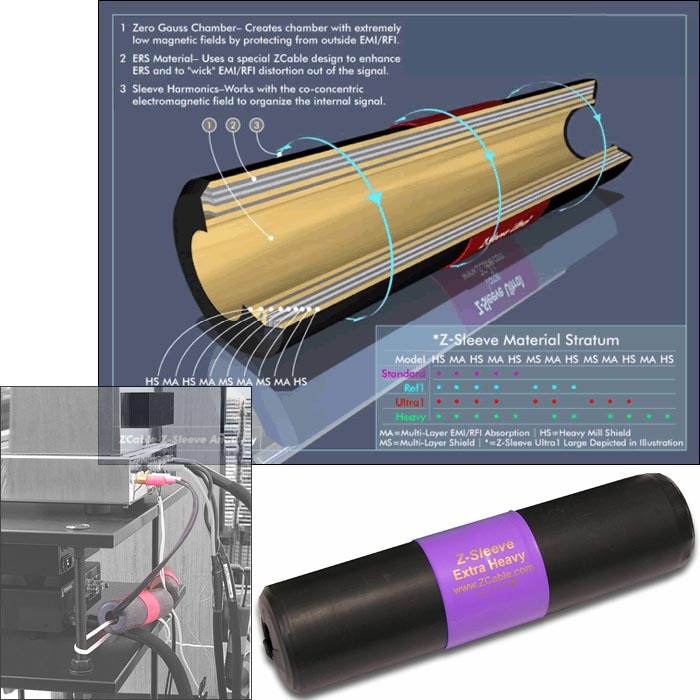 A Z-Sleeve is a zero gauss tube that slips over a cable. It does not connect to the cables in any way and does its effect passively, not in circuit. The Z-Sleeve is 8 inches long with an internal diameter of 1 1/8th inches. Most speaker cables slip through the sleeve without any problem. If your speaker cable leads are long enough, then putting Z-Sleeves over the leads themselves is most effective, if not, put the sleeve over the body of the speaker cable (placing the sleeve closest to the speaker). On an interconnect or coax digital cable, the sleeve slips over the top of the cable and is placed closest to the receiving component. The Z-Sleeve reduces distortion and focuses the signal just before it goes into the speaker or receiving component. It does this through passive organization on the surrounding concentric magnetic field surrounding propagated by the speaker cable's signal. The Z-Sleeve will reduce high frequency noise, increase mid and bass definition and improve coherence, spatiality and dynamics." ZCable's website goes into great detail on how and why the sleeves work and contrary to some of the silliness that passes for an explanation of some other products, ZCable's information doesn't strain credibility and I highly recommend a trip over there for additional background on their products. I concluded my original review of ZCable's sleeves with almost as many unanswered questions as answered ones. Almost two years later I can answer some of them. But let's recap what I already knew. First -- depending on mitigating factors -- you may or may not hear an immediate difference upon insertion. It takes up to 24 hours for the sleeves to work their magic. Second, at the completion of the 24th bewitched hour, you will notice many changes. The deeper the bass capabilities of your speakers, the more you'll notice that the bass notes are cleaner, sharper and more distinct. Bass power may or may not increase but the subjective increase in detail and musicality is a certainty and it may make your system subjectively more powerful. The midrange will be both cleaner and more highly resolved, likely the result of a lowered noise floor - your system is now bereft of a layer of heretofore unnoticed dirt and noise. Microdynamics are also noticeably more pronounced and the music is more rhythmically nuanced. Upper midrange is also cleaner and smoother. Female vocals are cleansed of a layer of hash that, again, you didn't even know was there just riding atop the melody. Image focus is also increased appreciably. Treble is cleaner, smoother and more palpable. One question I was left with almost two years ago was with regard to the possibility of over-Z-Sleeving. Can you overdo a good thing? Is there such a thing as too many sleeves? Well, I've come to realize that you cannot overdo them - you can't overshield your system from the effects of airborne RFI and EMI grunge. What about Z-Sleeve synergism? Where it comes to Z-Sleeves, does 1+1 ever equal 3? Well, yes and no. While adding additional sleeves to the same wire, cable or interconnect most certainly do produce additional changes, these changes become more and more incremental and those increments become smaller and smaller. But that doesn't mean they become unimportant. Consider the incremental improvements wrought when moving from an excellent preamplifier to an even better one. Incremental? To be sure. But sometimes those incremental improvements are of almost monumental importance to you even if your neighbor can't hear the difference. The same will be said of Z-Sleeves. The incremental changes may become smaller but you'll appreciate them nonetheless. What's not so incremental, though, is what happens when you attack different areas of the system at once. Shield the interconnect coming from your turntable on its way to the first stage of amplification where the signal is both weak and susceptible. Then treat the interconnect as it goes into the power amplifier, as close to the RCA inputs as you can place them. Then again at the speakers' binding posts. If your experience mirrors mine, the result will be something that won't be trivialized. At the very least, it'll be akin to improving every component in your system. Amazing, really. That sounds like an overstatement, even to me. But it's true. The only proviso I have is that your environment must be something like mine, with evidence of radio frequency interference or other electromechanical interference everywhere. Frankly, these days, I don't know where you'd be able to get away from it. What doesn't respond to Z-Sleeves? Nothing doesn't respond to Z-Sleeves, at least not in this house. Power cords do. Speaker wires definitely do and interconnect cables most certainly do - and the lower the voltage passing through them, the more they do. Phono interconnects? You had better believe it. But one place that I had never even given consideration to before was the digital interconnect. In my case, I'm using a Furutech Digi Reference digital cable, which already has a similar type of filter attached. Within an aluminum barrel clamped to the cable -- in a way similar to the way the Z-Sleeves are utilized -- Furutech has created its own quasi zero-gauss chamber as the container is filled with what Furutech calls GC-303. Well, the Extra Heavy may or may not be better than the GC-303 Furutech uses. I can't remove it so I can't tell. But the Z-Sleeve certainly took the cable and system performance to another level. Placing the Extra Heavy sleeve on the Furutech really opened up the soundstaging on the system and injected it with a noticeable degree of additional air and space. What else? Well, nothing else, really. But it was unexpected when one considers the relative pittance of $399 for the Extra Heavy and the price of a new digital cable that may accomplish the same thing (if you can find one). And even if you do upgrade your digital cable, the Z-Sleeve stays in the system. You don't give it up in the upgrade process. And who knows what the sleeve could accomplish with lesser cables. When it comes to the Extra Heavy Z-Sleeve, ZCable's Mark Hampton didn't lie. It is markedly better -- more productive -- than the Ultra Sleeves I've been using. It does exactly the same thing, just a little better. And unlike the Ultra, the effects of the Extra Heavy are more readily apparent. Or maybe it's just me and I know what to listen for. In any case, I can hear some of what the Extra Heavy's up to as soon as I put it in the system. By the next day or so (Hampton says it may take up to 40 hours), it's up to full strength. So good is the Extra Heavy that ZCable's going to discontinue the standard Heavy. Hampton tells me that his dealers suggested that the Extra Heavy, at $50 more than the Heavy, makes the Heavy superfluous in the line. Not having a Heavy in the house, I can't say. But the Extra Heavy is much more effective than the Ultra for sure. Unlike a lot of other products from other manufacturers, the improved performance of the Extra Heavy does not make obsolete the rest of the line, or -- if you're a Z customer -- the sleeves you already own. If you've already been copping your share of Zs, a couple or more strategically placed Extra Heavy's added to your collection --not replacing them -- will be of added benefit. When it comes to Z-Sleeves, the more really is the merrier. 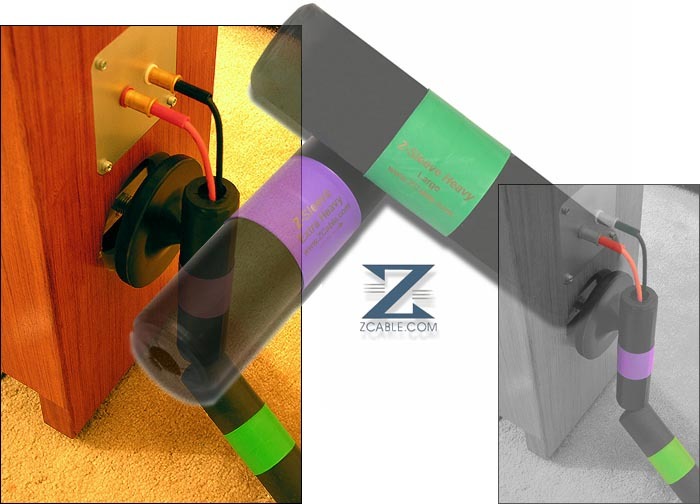 Did I mention that Balanced Power Technologies uses ZCable's Z-Sleeves inside their products? For the last two years, I've been using BPT's 3.5 Signature Plus power conditioner and if you pop its top, you'll find a ca. 4-inch version of a Z-Sleeve. As it happens, I upgraded my 3.5 Sig's 30-amp power cord quite some time ago with ZCable's Heavy Power cord with excellent results. So when Mark Hampton mentioned that he had discontinued the Heavy Power cord and replaced it with the RED LIGHTNING and BLACK LIGHTNING cords, he got my attention. And when he told me that not only had he replaced the Heavy Power cable but no longer fitted these cables with a sleeve, my attention got piqued. In short order, the man in brown dropped off two samples of each power cord. Were it not for their labels, it would be impossible to distinguish between the RED and BLACK. Both are 12-gauge cords of the medium compliance variety - not as flexible as some, more flexible than others. Recommended for all manner of components, the cords are intended for light duty DACs and CD/DVD players, surround processors, home theater receivers and most amps. Z does suggest that the 12-guage cord is not optimal for amplifiers of over 200 watts. Both use Wattgate 330i male connectors and copper conductors along with a highly elastic low-mass female connector that stays put within the IEC receptacle and accepts an additional Z-Sleeve if you wish. The main difference between the two cables is the amount of shielding. The grounded shield on the BLACK LIGHTENING utilizes a 3-layer wicking shield that is said to be dramatically more effective than conventional shields at protecting against EMI and RFI. The shield is also said to "energize" the upper frequencies in a similar way as ZCable's own $2,000 CYCLONE cord to create a highly defined and special 3-D experience. On the other hand, the RED LIGHTNING uses the same 12-gauge copper conductors but is ground shielded with a 5-layer wicking shield - two additional layers over that found on the BLACK. 1. protect against RFI and EMI. Different shielding materials protect against different "noise" bands. 2. Not to saturate and thus lose effectiveness as a protection against EMI/RFI. This is usually done through grounding the shield. 3. To not have an adverse effect on the concentric magnetic field propagated by the signal cable and thus producing an adverse effect on the signal itself. 4. If possible, support and help organize the concentric magnetic field propagated by the signal cable and thus produce a cleaner and more organized signal. In our "wicking" shield, we have mixed shielding materials to achieve the widest range of protection against noise bands. Some of these materials, which block very wide ranges of EMI, normally would reach saturation easily. We have layered these shields with other more conductive shielding materials. The lower resistance shields "wick" static charge from higher resistance shields. The result is a very broad range shield that does not saturate. This layering had to be applied in a way so as to not slow, dull or have any other adverse effect on the concentric magnetic field of the cable. A refinement of that layering design is one of the enhancements of these later versions of the LIGHTNING power cords." In use and as compared to stock cords, both the red and the black cords were drastic improvements offering effects indeed very similar to that rendered by the Z-Sleeves. In short, they bettered stock cords in just about every aspect including a clearly less veiled and more detailed midrange, a more spacious sense of air at the top, cleanly defined bass down below. Transparency is improved overall and the treble is markedly smoother over all. There's not a system in the world that can't use a little more of any of these aspects, is there? Excellent cords and a no-brainer recommendation, for sure. But which ones? After doing some listening for myself and then reading how ZCable describes the difference, I was reminded of that old song lyric, "you say tomato, I say tomato"... well, you know what I mean. Of the RED LIGHTNING, ZCable claims a warmer sound with less high frequency emphasis than the BLACK. Oh, really. Of the RED, ZCable claims less brightness and hash. They claim to reduce harshness and glare as compared to the more detailed BLACK. If the BLACK seems to impart too much detail, then the RED is recommended. Is that so? I'm being a little facetious here and my reservations probably come down to the vagaries of applying language to sound. And how one goes about describing the sound depends upon whether your system is half-full or half-empty. In my system (as it was composed that day, anyway), I clearly preferred the RED and while it may have taken a bit of time to zero in on the differences, once I had, I thought the REDs were decidedly more synergistic. ZCable may claim less brightness and hash for the REDs but I actually found them more, shall I say... illuminated with slightly greater nuance. Not bright at all but I did find the stage populated by instrumental outlines that were more palpable and clearly defined - more visual. My first thought was indeed "bright" but there was nothing bright about it, just more light shed on the subject as if someone flicked on a spot over the stage. This seemed to challenge ZCable's claim for greater detail from the BLACK, which presented a darker soundstage with less instrumental focus - in my system, anyway. With every speaker in the house, the RED would be my first choice. But had I Martin Logans, JMlabs or Thiels, I would imagine that my preference may indeed move toward the more subdued, slightly rounder BLACK, resulting in a slightly more organic and natural presentation. amplifiers and are looking for a way to both avoid them yet step up the performance of your amps, the LIGHTNINGs look like a great option at a competitive price. Almost as surprising as my experience with the Z-Sleeve on my digital interconnect was what I found when I plugged a BLACK into the back of my Gallo TR2 subwoofer. Louder output? No. Deeper output? I don't think so. But what did happen was that the subwoofer disappeared from my room. Not that I thought that I had been hearing it before, but the sound of the bass became a more highly focused point in space. Rather than a large billowing mass of bass that encompassed the stage, I noticed that the sound seemed to come from a much more highly focused location on that soundstage. It appeared that the greatest concentration of bass energy was coming from the actual instrument. The moral of this story is to consider all the cords in the system, not just the ones going to the rack-mounted components. I suggest getting into ZCable's products the same way I did - start with the sleeves. If you don't want to use the shotgun approach, alternately try them on the interconnects and your power cords and see where they benefit most. They aren't cheap but more cost effective than changing out all your power cords. For the price of a single power cord, you can treat both the interconnects and the stock power cord on a component. I believe that once you try them, you'll be glad you did and feel very inclined to try some more. Once you've got your system all sleeved up, I heartily recommend that you start looking at replacing your power cords. This stuff's just terrific. Take ZCable up on their 30-day offer and see if you don't agree. My prediction is that a year later, you'll still be glad you did. Great review. Thank you very much. I appreciate your thoroughness. I know the Z-Sleeves are a challenging item to review as they have many applications and as such, are time consuming to fully investigate. Also, I enjoyed reading of your experience with the LIGHTNING power cords. This made me smile the most. Because I knew how correct your observations were. I realize that on my website I have indicated the BLACK LIGHTNING (BL) is more detailed than the RED LIGHTNING (RL). And I realize your testing indicated the opposite. You couldn't be more right. Let me give you some brief background. 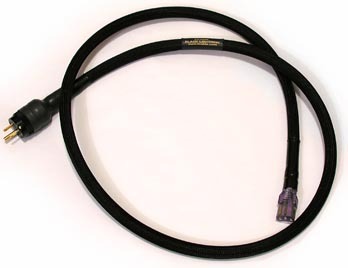 The RL power cord was originally developed for digital amps and DACs. In fact, I have tested the RL on 10 different digital amps. (Yes, there are that many) Years ago when I first started testing digital amps, I determined that they responded very favorably to shielded power cords. Soon my testing showed that the better the shield, the better the digital amps performed. This effort to create a very strongly shielded cord led, over a period of time, to the current RL. The BL was developed later, due to the fact that in some analog applications, the component needed a higher frequency tilt to achieve the desired detail. This was accomplished primarily by using the Wattgate 330i connector. The BL was never designed to optimize digital applications the way the RL would. So... for digital, more nuance is accomplished best through shielding and for analog, nuance requires some tonal adjustment, which the WATTGATE male connector provides. You used both the BL and RL primarily on your Bel Canto e.One REF1000 mono block digital amplifiers. With this application, the RL would most certainly perform best and give the greatest inner detail, organics and nuance. Like I said, you couldn't be more right. And I need to update my website with some reference to the RL and its unique suitability for digital amps.